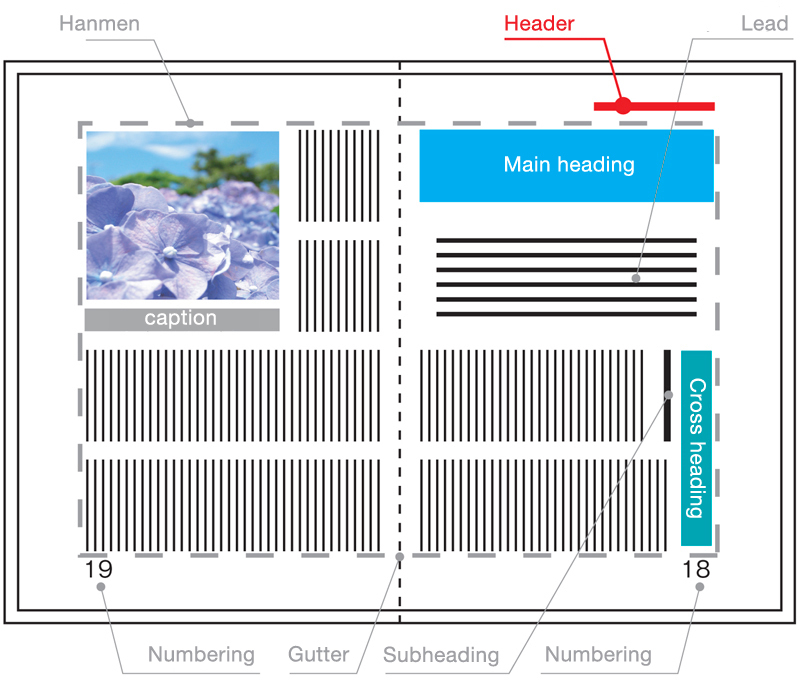 Headers and footers carry the document title, chapter, section and/or main points and are positioned in the margin area outside the main text area on pages of books, magazines, and other book-type publications. The purpose of this information is to make it easier for the reader to find the page with the information they want and they are sometimes omitted from literary papers, magazines, etc. Headwords in dictionaries are also a type of header. Headers and footers can be placed on both odd and even pages or on one side (usually odd pages) only. Their contents are generally an expression of the headline in the main text. If both even and odd pages are used, the content on the odd page will be more confined and the content on the even page will be more extensive (if the odd page indicates a chapter, the even page will indicate the book title and if the odd page indicates a section, the even page will indicate a chapter). If one page only is used, it will contain the title of the book and the chapter. With magazines in particular, this will carry the name of the magazine, the year and month of publication and the issue number. Uniform headers and footers may carry the same information, such as the book title, throughout. As this has little practical significance, it is no longer used very often in books. In contrast to this, some publications have different headers and/or footers on each section or page. Where pages contain headlines, it is common practice to omit the headline from the header on that page. Headers and footers are located in the upper and lower margins of the page and generally in the center or towards the fore edge but, where vertical text is used, they are sometimes located in the margin on the fore edge side. The text string in headers and footers is often given a particular letter spacing. When creating a publication on a computer, the header or footer text string can be set to be handled differently to the main body of text by the word processing or DTP software. Generally, headers and footers are displayed on multiple pages in the upper and lower margins with word processing software or on a master page which specifies the elements to be displayed on all pages with DTP software. With Japanese publications, the book title and the volume number are shown on the fold line on the fore edge of a bound double-leaved book.